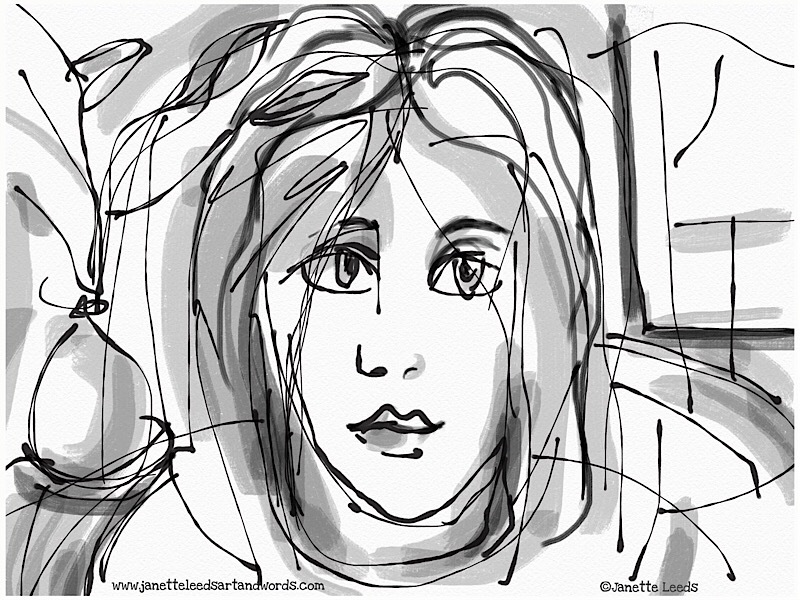 A quick sketch, with my finger, using the ink pen in the “Sketches” app. With some freehand tonal work, and a little more linework added in the “Procreate” app, using the ”Gesinski” ink and the “Flat Marker”. It’s not long before I return to drawing a woman’s face; a favourite subject matter since my youth. I share more about it here. The ink pen in the Sketches (Tayasui) app, has a lovely inky feel. I also did a copy of it on paper, using a “Uni-ball”, and “Artline Calligraphy” ink pen. Uni-ball, Artline Calligraphy pen, and tonal work with washes from a black Inktense block. Accidentally put a blue watercolour wash on the hair. Another ink pen and wash drawing below. *To enlarge the images, please tap on one of them. Began with a fine micron pen; added thicker lines with an Artline Calligraphy pen, and then brushed on tones with washes from a black Inktense block. Added colour freehand with the Charcoal block in Procreate. I changed the drawing a tiny bit as well. Printed the pic and then added some watercolour and coloured pencil. A quick video of adding colour, using the “Charcoal block” freehand in the “Procreate” app. Nice! Ive never used sketches…I’ll try it! I’ve only ever tried procreate and adobe sketch…I like procreate the best but I think both have their advantages. It’s a really cool technology, and I love seeing how other people use it. Keep up the lovely drawing! I’m viewing your post on a much larger monitor than what I’m used to, now that I’m using the TV that we replaced over the weekend, and my oh my, how cool it is to see your artwork, even the video, in such vivid detail. What a way to christen my new arrangement! Thanks Paul, feeling flattered to be viewed on the big screen! I just had another lovely visit to your site – so many of your works delight me both in their visual content and incisive wit. There’s many I’d love to have as prints…hoping you’ll upload some more to your Red Bubble site again soon. (I just reopened a shop there). It’s easy for me to buy them on there, being way over here in Australia. Perhaps you may have time to place there, some of your animal drawings from your recent post about your trip to Africa, and some of your flower, boats and garden view artworks…oh and I’m keen on this one of your dog – https://portfoliolongo.com/2015/07/26/cowboy-with-ball-in-the-grass/ Anyway, just thought I’d let you know. 🙂 Think I’ll be revisiting that Sketches app again soon – good fun! Looking forward, as ever, to your future posts. Thanks for the encouragement to upload some images to Red Bubble. It was you who told me about that site in the first place. Every once in a while I get a notice that I’ve made 18 cents or something like that. Ha! That’s OK, I’ll spend some time on that today and tomorrow. By the way, have you ever tried Sketch Club? If I’m not careful, I find myself going to that app and that app only…just because of the “sketchy” brush. There’s something about that brush that allows me to express myself fluidly. Just wondering if you’re familiar with that app. Thanks so much for visiting my illustroblog. I’ve got some updating to do there. Such kind words, thanks Paul! As for Red Bubble, I think I’ve made only few cents, but that was only through friends buying something! Anyway, it’s a handy place for some personalised gifts… I also like the option of having things printed privately. And occasionally I buy a few bags and studio pouches… from there to sell locally. It’s fun to see one’s art on various items – I do like to see my art on practical things. I have the Sketch Club app, but haven’t used it for a while, so I just went over there for a play. That “sketchy” brush certainly allows for intriguing line-work. Also like the pattern making facility in there; and that you can make a custom size drawing surface, and a transparent png file…actually, these options can be quite useful on a site like Red Bubble. Thanks for the reminder about this app! Hi Janette, I have enjoyed viewing your recent posts. I admire the lovely, loose lines on your faces. The blue colour wash on the hair was a happy accident.